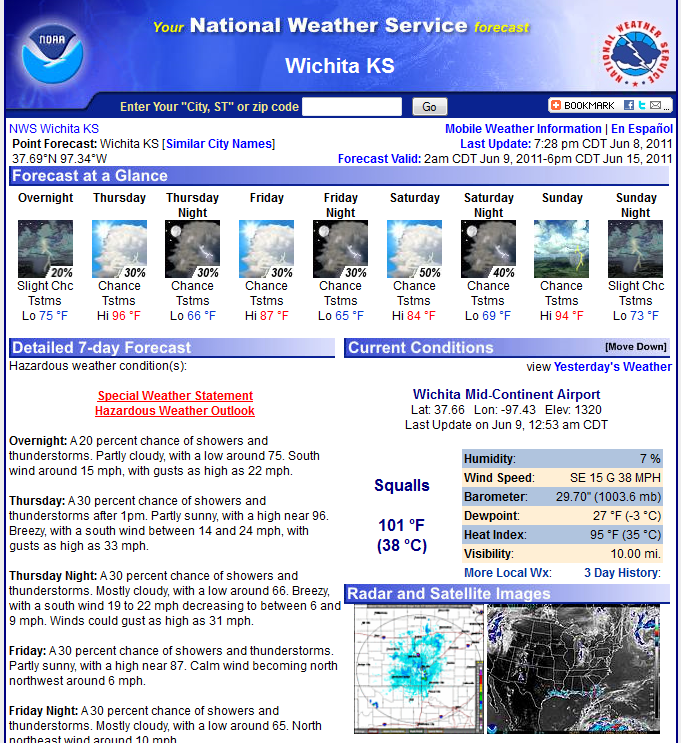 Heat burst hits Wichita: 102 degrees at 1AM | Watts Up With That? Wichita, Kansas was hit with a thunderstorm induced “heat burst” early Thursday morning, with the temperature jumping from the mid-80s up to 102F after midnight! Wichita has now experienced the earliest string of 7-straight 100F+ days (so far) this June. A heat burst is a downdraft of hot and dry air that typically occurs in the evening or overnight hours. A heatburst is much more rare than a severe thunderstorm. Thus, the atmospheric conditions have to be just right for a heat burst to occur. Heat bursts usually happen in the evening or at night after thunderstorms are ending. Thus, a thunderstorm has a vital role. Two other characteristics are that the air must start its descent from fairly high up and the environmental air aloft needs to be very dry. Precipitation falling into very dry air aloft will cause the air to cool through latent heat absorption. If the air is very high aloft and the air is much more dense than the surrounding air then it will accelerate toward the surface. In the case of a heat burst, all the precipitation that cooled the air aloft has been vaporized. Therefore, the precipitation can no longer absorb latent heat. As this dense air accelerates toward the surface it rapidly warms at a dry adiabatic lapse rate compression. What must make a heat burst so rare is that this downdraft must reach extremely high velocities. Velocities must be high enough so that the momentum of the sinking air offsets the fact that it is becoming warmer in temperature and thus less dense than the environmental air it is falling into. Not only is the air in a heat burst anomalously hot but it is also extremely dry. The extremely high temperatures combined with extremely dry air plus the wind can remove all the moisture out of vegetation. Just like any atmospheric phenomena, heat bursts have differing intensities. The worst heat bursts persist for a significant amount of time and have temperatures that go over 120 F, even in the middle of the night. This extremely hot and dry air can remain in place for several hours before temperatures return to normal. Interesting read. Unfortunately, here in Australia this weather event is not being reported in such a balanced, or even factually correct way. An underlying AGW spin is still detectable in the newscasts. I take that last bit of my first post back. AGW *IS* being firmly fingered for the increase in heatwaves, bush fires, floods, snows and…tornados in the US. Wow..!!! Hopefully no one lights a match out there in farm country. I am sure everyone is awake right now wondering what the heck just hit them. Also there is a Solar mass ejection coming toward earth but I don’t think the two events are related in any way. Nice snippet of information. Thanks, Ryan. Well wait until morning and it will be reported everywhere that global warming is trying to kill us all even with the temperature is dropping as we speak. Incredible! I lived in Wichita for 13 years, but never experienced something like this. Hope the vegetation really is OK, considering the effect heat bursts can have (see the article). That’s really “cool,” I don’t think I’ve heard of a heat burst before. To be left with a column of hot buoyant air above you, the air pressure ought to drop, and indeed, Wunderground traces show the effect quite nicely. Interestingly, the pressure drops before the heat reaches the ground, another indication that downward momentum is vital. Start at http://www.wunderground.com/US/KS/Wichita/KICT.html . After the airport data, there’s a table of Wunderground’s members’ stations, click on some that have sensible looking data, then look at the daily plots of weather data. http://www.wunderground.com/weatherstation/WXDailyHistory.asp?ID=KKSWICHI41 is an overall warmer spot. Bad calibration? More like it’s just in town and has UHI. They hit 102, and dew point 26 a few minutes before. The dew point is likely wrong, it’s derived from the relative humidity and air temp, and the humidity sensor is slow to respond. 5-10 minutes after the 102 temp, the dew point was records as 34, I think that’s more likely. Still remarkably dry for the region – 10% relative humidity in the middle of the night! Heat bursts – Another kernel of knowledge courtesy WUWT. Thanks, Ryan. Could instability created by heating a patch of the upper atmosphere with, say, 3 billion watts of radio energy cause such rapid vertical displacement? Here in the NE we’ve been hearing about this horrible hot weather… in June… but oddly all the record high temps are STILL from the 1930s and 40s despite decades of “unprecedented” heat. Anyhow, what a weird phenomenon. Don’t think I’ve ever had the pleasure of experiencing one of these. Jeff’s 13 years notwithstanding, this kind of heat is common in Kansas. I recall such heat waves as a child. My Dad told of a day in his childhood when two alcohol thermometers broke from the heat, one of them under a shade tree. His father said he remembered even higher heat. I’m in Oklahoma City these days, and it has not been hot here yet. At least not to me. We almost made it to 100°F a couple of days ago, but when I was outside, I kept noticing how cool the breeze was for such a warm day. Extremes of cold, heat, wind, drought, flood, we have it all. I suppose growing up with less extremes makes one more susceptible to it all. There is no cause for alarm. The Kansans have survived worse. BTW, check the Wichita, KS, weather stations. Intersting graphs, but the heat was only about an hour. I bet most residents will never know it happened. Warm 70s this morning. Quite ordinary. Which reminds us there is nothing unusual about tornadoes this year. Clearly this is not weather but Climate. I wasn’t awake when this happened, but it definitely seemed weird to me when I went outside this morning and there was not a trace of rain left anywhere. Even tall grass at my farm is completely dry, down to the ground. Interesting read. Thank you. Customer of ours just came in and told us his tomato plants and spinach plants are all brown. Yesterday he was in and these plants were thriving. So much for fresh veggies. Said his neighbor’s had large tree branches and such down in his yard. Grass was brown also. So guess the heat burst took all that moisture out. I live in Wichita and it’s been very hazy the last few days as well as hot. The local weatherman said the haze is due to the jet stream blowing in the smoke from the fires in Arizonia. US conservatives appear to be having their own Winning The Future mental seizures. Strange. Being two hrs east, it is warm here now. I would’ve hated being there last night. Well, better them than me!!! I can just see it now……global warming tries to kill us in our sleep!!!! I live in Wichita. There was no thunderstorm associated with this “event”! It has been hot and dry and very windy. This general weather 100F happens frequently in July and August. It’s about a month early this year. After the 1AM “event” the temperature went back to normal (80) quickly. The one thing I have noticed lately is that sometimes the radar shows light rain, but none seems to be reaching the ground. My mother experienced something like this in 1934 in western Kansas..
She had in her diary that it went up form the mid 70’s to 100+ in minutes. We live near McConnell AFB, and were right in the midst of the damaging winds associated with the ‘heat burst’ . We have several 4×4 fence posts that were snapped, tree limbs down all over the neighborhood, and broken windows. When it happened, it set off car alarms all over the subdivision. When we went outside last night to look around at the damage, it was 102 degrees at 1 in the morning. No rain at all though. Low altitude volcano plumes nearer the equator. Stratosphere honkers nearer to polar regions. Sharp, sharp temperature gradients. Earth is a perturbed tornado factory. Very interesting. I’ve lived here on the Southern Plains (Oklahoma) for more than thirty years and noticed that it sometimes heats up quite a bit after a thunderstorm, but never thought about why. Oh, dear. Another example of “global weirding”. Global weirding being, actually, the Bill Shatner type: unusual, natural stuff we never knew before. Harold Taft* details a ‘heat burst’ event in a book he co-authored In 1975 with fellow KXAS meteorologist Ron Godbey titled “Texas Weather”. I sincerely loved Harold’s common sense forecasts, his hand-drawn wx maps (pre-automation/computerization days), and his ‘deviation’ from the party NWS ‘line’ with his own prognostication/weather forecast when warranted. Classic Harold Taft with Chip Moody showing off some old weather tools. PS Harold, we miss your humor and your wx insight. May you R.I.P. > Could instability created by heating a patch of the upper atmosphere with, say, 3 billion watts of radio energy cause such rapid vertical displacement? No, the heated air would be more buoyant and lift upward. From Ryan’s description, it took rain to cool a patch of dried air to get it moving downward fast enough to keep going all the way to the ground long after the rain evaporated. Perhaps if you heated a ring of the lower atmosphere with your 3 Gw for several minutes you might get enough convection to cycle air and have a downward column of air in the center. It would have a dew point much higher than 30, though because there would be no way to dry the air. > We live near McConnell AFB, and were right in the midst of the damaging winds associated with the ‘heat burst’. Looks like an ASOS station, reporting at 0:55 minutes each hour, but apparently triggers on interesting events, i.e. several between 0100 and 0111. Max temp 98.6, min dew point 24.8 (RH of 7%! ), pressure drop of 0.10″, peak gust of 62.1 mph, sustained of 40.3 mph. What was going through your mind during the event? Please name for me the frequency band(s) of said ‘radio energy’ used to heat ‘air parcel’/the atmosphere and we can get back with you (Hint: it won’t be in the range of 3 to 10 MHz). Said RF energy would be effective on the ionosphere, however, at a range outside the range of ‘weather’ though. Addenda: A 15 x 12 element planar array mounted on earth’s surface has, at the least, an effective angle above the horizon of about 45 degrees (normally range of +- 30 degrees from boresight). A beam directed at the horizon on any compass bearing is not possible (sin 90 deg (msrd from boresight) = 0). Are we sure it isn’t actually caused by a huge VTOL UFO hovering over the area with its jets directed downward? My power plant puts 3.9 GW into the local atmosphere, year round. It doesn’t cause much of a disturbance, except from time to time you can see hundreds of buzzards riding the thermal until they are tiny black dots and then finally disappear from naked-eye view. Please do not feed the HAARP troll. Sounds like another verison of LA’s Santa Anna wind. > Sounds like another verison of LA’s Santa Anna wind. Not really – this is vertical transport of warm air. The Santa Ana wind is a low (I think) level wind that follows the surface for hundreds of miles starting with cold, dry (and hence dense) air. After the past two days of well hyped Eastern US heat it looks like there is quite a rapid cool down in progress now, for all areas except the Southern Plains. Of course here out West, even though storminess is now limited to higher latitudes, cool conditions persist. Now….less than 24 hours later…Nature has a way of balancing itself out. Training severe thunderstorms, with 1.25 inch hail, 60 MPH gusts, and over 2 inches of rain….and temps at a comfortable 66 degrees F.
* until 1230 am CDT. very heavy rain from a thunderstorm over the warned area. and you will then be stranded! THX to those who offered insight. I could do without the ad hominem stuff. I am not a troll, just ignorant — which is why I come here. Thanks to the moderator for letting me in. I pose the question b/c I really don’t understand the phenomenon. The “planar phased array” antenna is said to heat the ionosphere thru resonance effects (?). If the beam can be focused (? ), would it create a sort of fireball?. Could this affect the lower atmosphere? Does the heating effect of EMF only occur in the ionosphere? Thanks in advance for any gentle enlightenment on this subject. Bernie, there are more than just a few reputable sites that address how and what H A A R P is actually used for; those websites would be a good place to start studying that subject. Plse, mods, it is understood the reason for this, but, we can do the public a service by properly addressing the few, low-level inquiries that legitimately arise on occasion (see the reason above why Bernie asked the question; WUWT being one of the few places he could get a proper answer … “I am not a troll, just ignorant — which is why I come here. Thanks to the moderator for letting me in.”). So, I respectfully submit an ever-so-slight revision to this policy when an innocent question arises. See, that HAA…P thing is a legitimate research facility and not simply the brainchild of the mindless conspiracy-industry types that have invented the most nefarious of ‘uses’ because of SSI (severe science illiteracy) coupled with the opportunity to sell books (‘make money’). I would submit that only legitimate mentions and cites be allowed through all-the-while continuing to snip at-will the ‘conspiracy’ based posts. Sometime back I made reference to the Riometer that is based as that facility, an instrument that measures ‘ionospheric attenuation’ by observing galactic noise as 30 MHz … at that time I also had to make a ‘special pleading’ to free up a post ‘stuck in spam’ owing to in-effect policy. To borrow a quote from Walter E. Williams, this is another opportunity to “beat back the frontiers of ignorance” regarding the legitimate uses of that facility. Thanks to Jim for the mention of the Texas heat burst of the late 50s. It occurred near Lake Whitney S/W of the DFW area on either a Wednesday or Thursday night. I just happened to be going to a technical conference in Dallas that weekend, and the event was the principal subject of conversation all weekend. It was years before the Taft/Godbey book came out and explained what the heck happened to all the crops in the area that night.